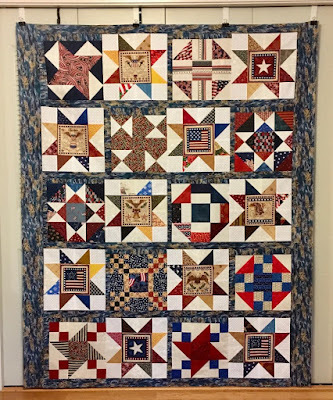 I used ten Patriotic Stars, seven of Teresa's orphan blocks, and three orphan blocks from the Two-Step mystery to create Welcome Home II. The orphan blocks were different sizes, so I framed them on two sides and paired them with the Patriotic Star blocks. The result isn't exactly what I envisioned, but I think it looks okay. Orange is not a color that I would pair with red and pink, but it doesn't look too bad when knit. The colors remind me of cranberries. My great-niece made a delicious cranberry sauce for our Thanksgiving dinner. It went well with the Kalua turkey and the smoked turkey that she and her husband prepared. My friend Julie makes a fantastic cranberry coffee cake. I have a recipe for cranberry bread, but I haven't made it in years. 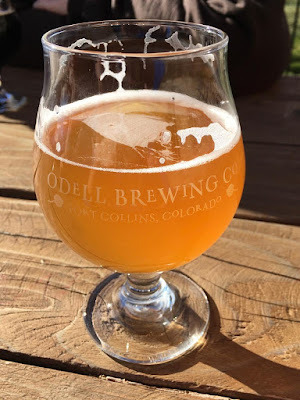 Instead of shopping on Friday, we went to a couple of micro breweries in Fort Collins, CO. At the Odell Brewing Company, I enjoyed Easy Street, a nice light-colored ale. Maria enjoyed a glass of Pineapple Cake and shared a couple of sips with me. It was tasty. 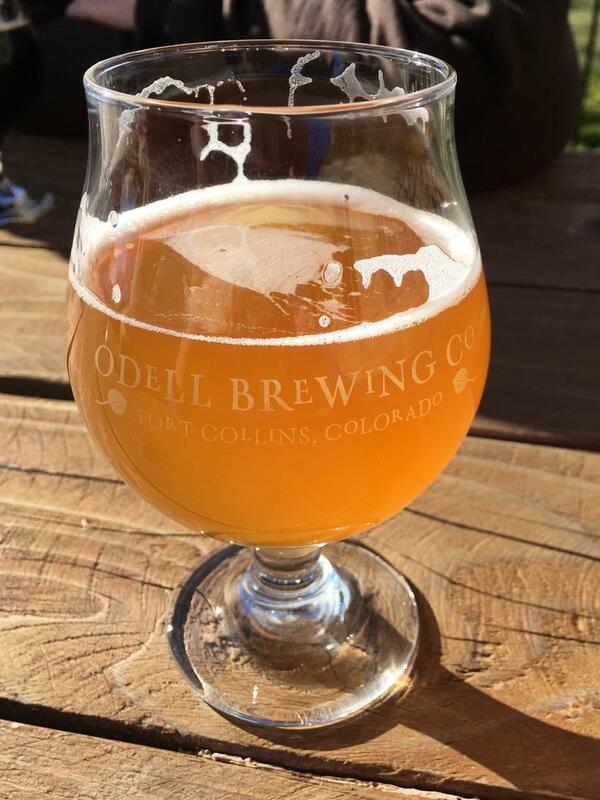 It was a gorgeous day, so we sat outside and enjoyed the drinks we had selected. 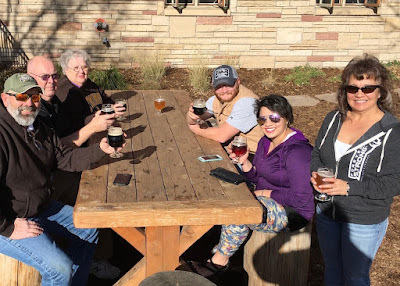 Some favored dark ales; others preferred light ones. The temperature on Thanksgiving was nearly 70 degrees, and Friday was in the mid-60s. It was too nice to stay inside. 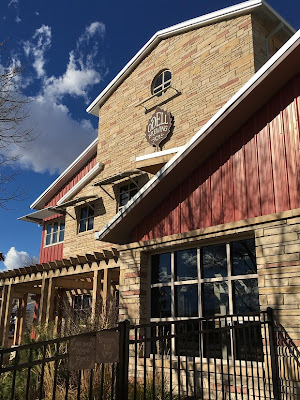 After Odell's, we went to Snow Bank Brewery, and there had an interesting ale called Cranknbrew - a crisp and clean pale ale infused with a powerful dose of fresh, locally roasted coffee. I liked it. Do you like to visit micro-breweries? Teresa C. in Tennessee asked if I would accept some red, white, and blue orphan blocks, and the package arrived last week. The photo shows a majority of the blocks she sent. 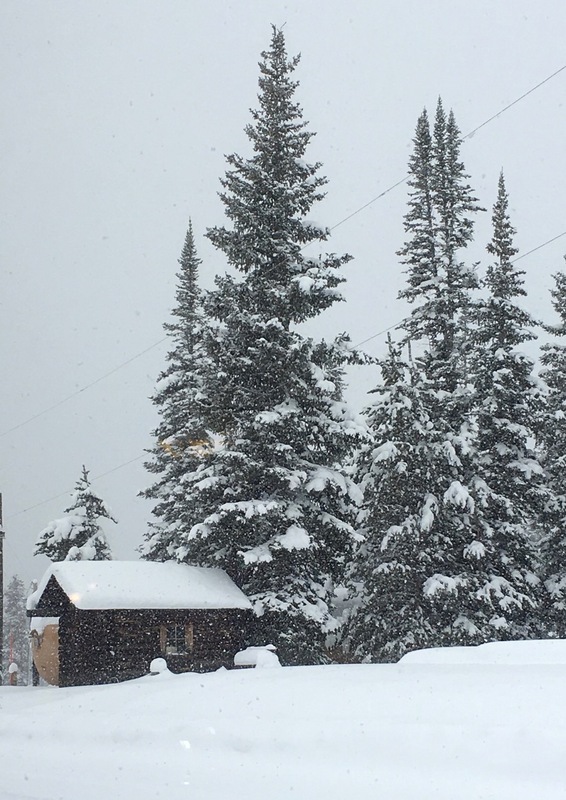 Most are 12.5 inches and others 8.5 inches. 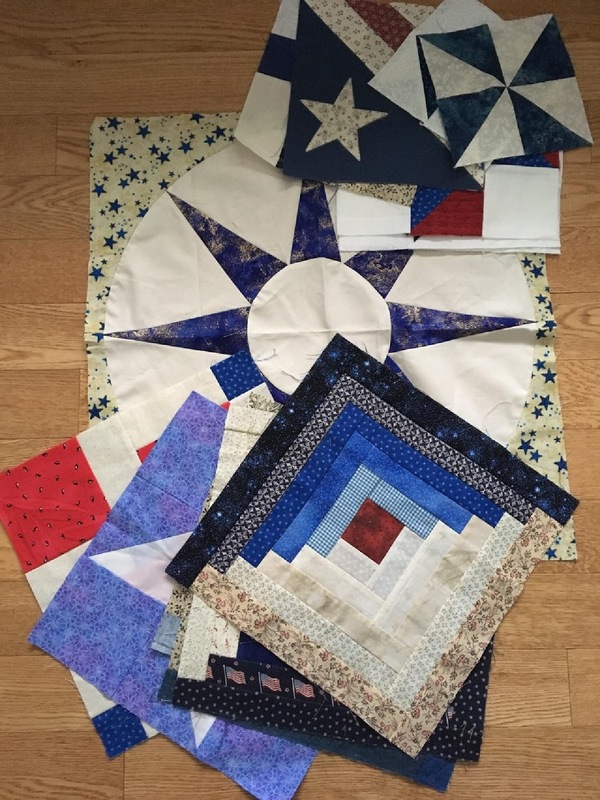 Seven of Teresa's 12.5 inch blocks are not shown in this photo because I pulled them for a quilt that I am currently making with the patriotic stars (see Wednesday's post). It can be a challenge to work with orphan blocks, but once an idea or layout presents itself, things seem to fall into place. 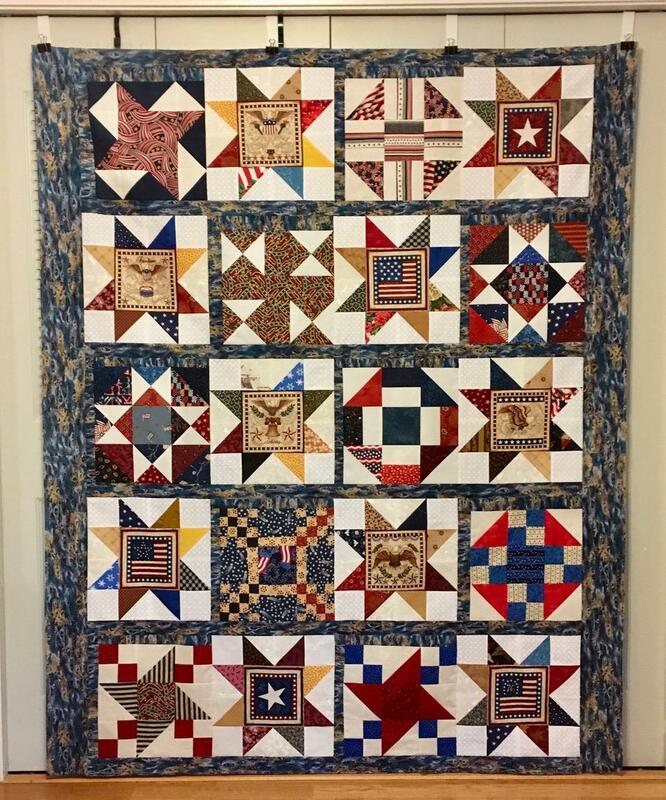 Teresa, thank you for sending orphans to make Quilts of Valor. 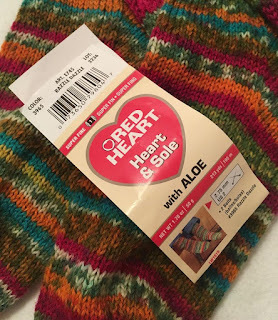 Friday posts for the next few weeks will feature ordinary or unique items that I consider helpful and/or essential to my crafting (quilting, sewing, knitting, etc.). I am not compensated for this or any other post: I'm just a satisfied customer. Accurate sewing requires a good iron and sometimes a spritz of starch. Even though the Rowenta is capable of pressing with steam, I never put water in it. This model does not shut off automatically (my older Rowenta did) which I like because it is hot when I need to press a seam or a block. Before I discovered Rowenta irons, I used Black and Decker models. I liked the Black and Decker irons at the time, but newer models do not get hot enough for my needs. I purchase Best Press (a starch) by the gallon, and use it often: it's an essential product for my sewing room. 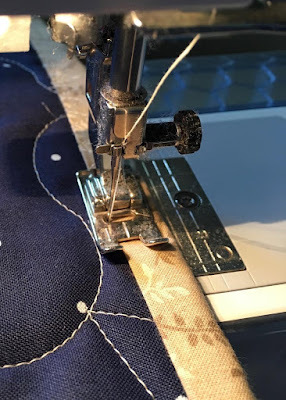 I like my quilt blocks to be flat and seams smooth because it makes measuring easier and creates a better surface for the longarm quilter. Best Press comes in various scents, but I prefer unscented. 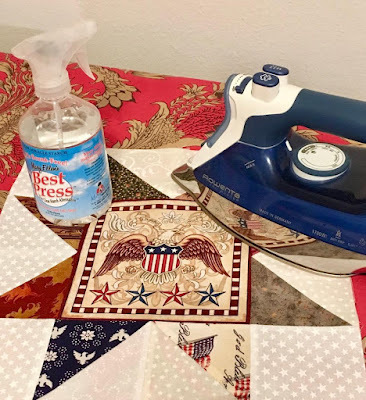 Some quilters mix up a connection with vodka that they swear is similar to Best Press, but I prefer the real deal. Best Press is also great for getting wrinkles and creases out of vintage linens. Do you have a favorite iron or pressing potion? 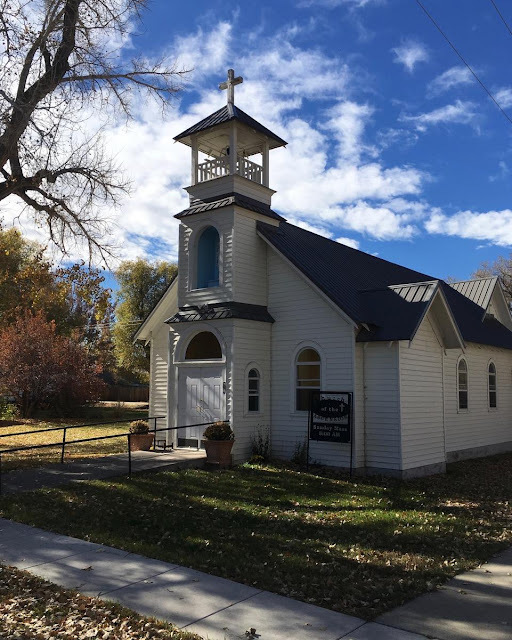 Exploring the small town of Hudson one afternoon recently, I discovered this church located across the street from the elementary school. I couldn't resist stopping and snapping a few photos of the area. Today is the perfect time to reflect on blessings (big and small) in our lives. • Marilyn gave me the panel in 2015 (post about that here), and I had every intention of using it before now. 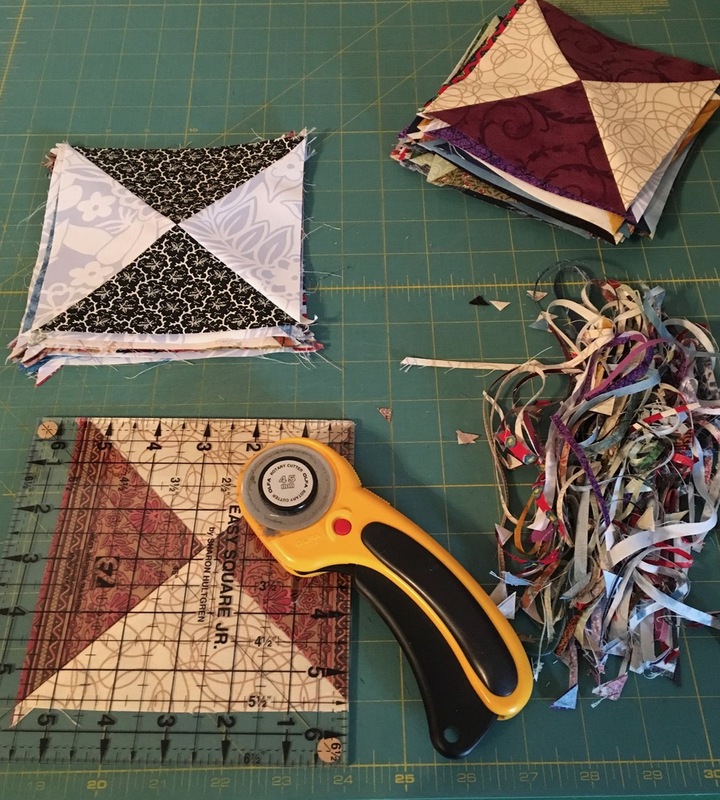 • In 2016, I finished two Quilts of Valor (Scrappy Lanterns and Cheerio), and they resulted in a lot of "waste" HSTs. • November 2017, the two components were discovered while cleaning, and I decided it was time to create some star blocks. 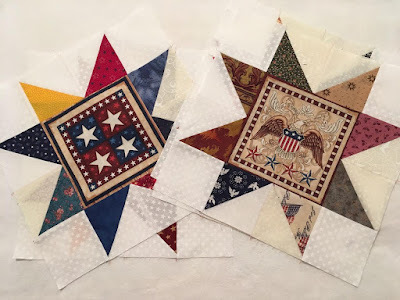 I made fifteen patriotic stars from the HSTs and the panel blocks. Marilyn, thanks again for the fabric and panel. The gentleman who machine quilts the Quilts of Valor is speedy, so over the weekend, I trimmed and bound four quilts. I've started using a decorative stitch to secure the binding instead of hand-tacking, and it's much faster. Thank you, Sheri H. for sharing your technique with me: it's been very helpful. Binding is no longer a chore that I dread. 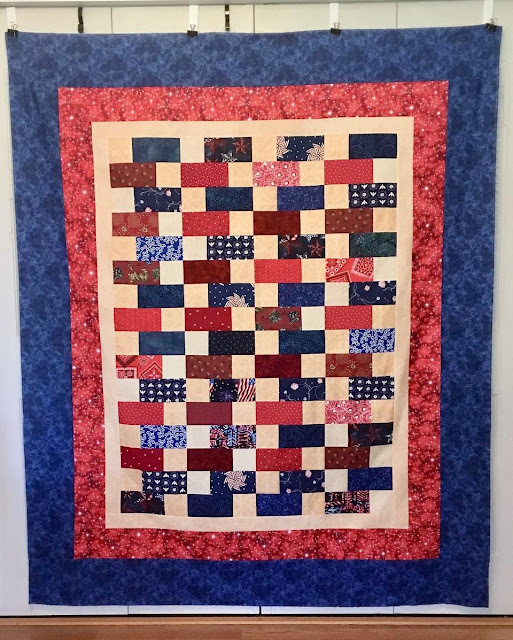 The center of Solid Foundation (Quilt of Valor #126) was made with "bricks" from my 3.5 inch x 6.5 inch scrap bin. 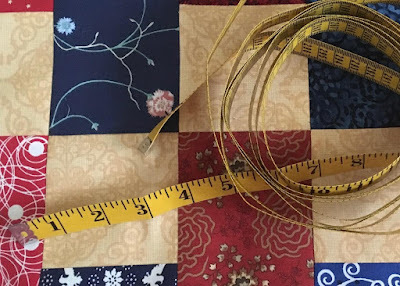 A long measuring tape (120 inches) is an extremely helpful tool for quilting. It makes measuring the quilt for borders much easier and more accurate than a traditional 60 inch tape measure. While this tape is convenient for measuring large quilts, I can't find a good way to keep it contained when I'm not using it. 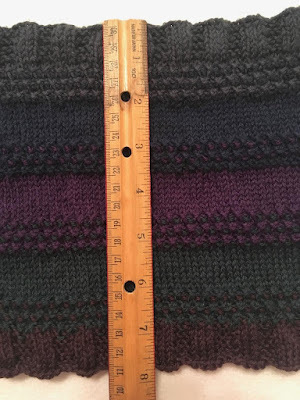 Do you have a favorite measuring tool? P.S. I didn't realize the link to the Stars over Scott (yesterday's QOV) pattern was not correct. It's been fixed. 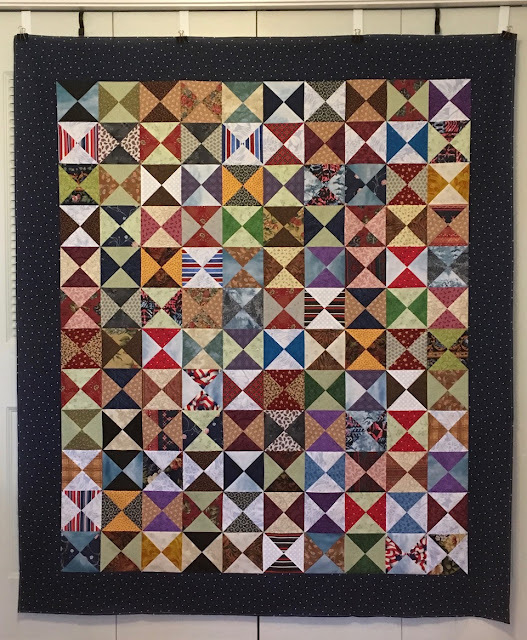 Another quilt made from the 6.5 inch scrap squares bin and from backing trimmings (background fabric) of other Quilts of Valor. I chose not to put a border on this quilt. I was able to knit another Tool Box cowl with the scraps. 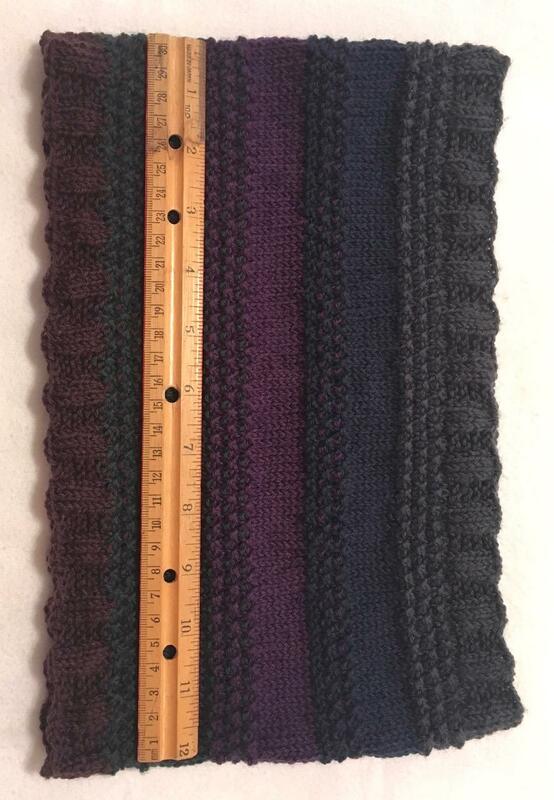 I knit fewer rows in the stockinette sections because I only had 12 grams of each color, and I used nearly every gram. 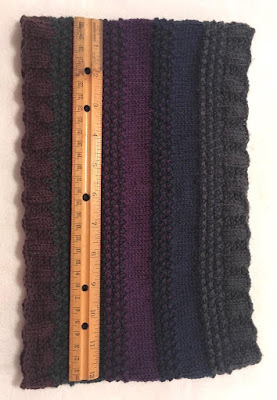 The cowl is only 8 inches high, but still enough height to be an adequate neck warmer. I don't think I'll block this cowl. Tool Box #1 can be seen here and here. 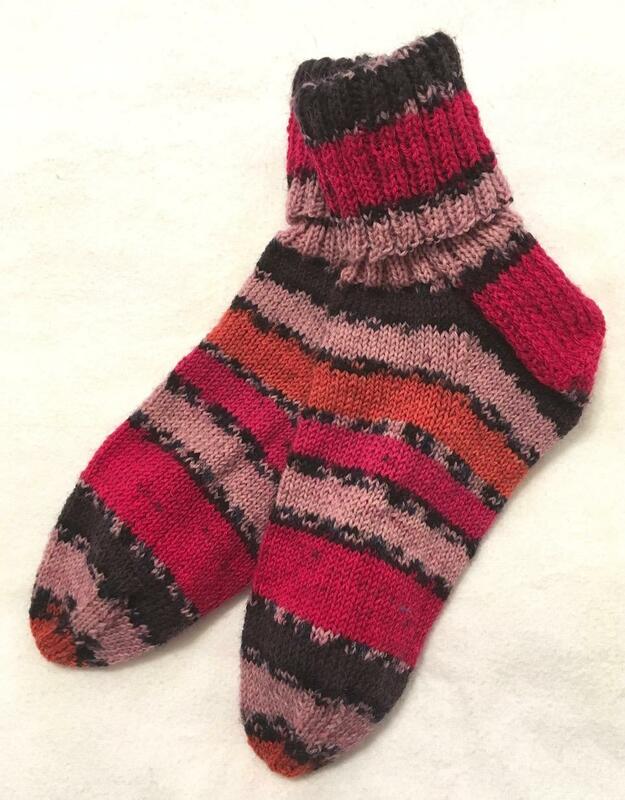 The yarn for this pair was obtained in the Grab Bag special I ordered from Mary Maxim in September. I love the bright colors. This yarn had one of the longest pattern repeats of any yarn I've ever knit, and I lucked out and came pretty close to knitting a matching pair. The hourglass blocks that I made for Time in a Bottle used only a fraction of the stack of 6.5 inch squares, so I needed to reduce the stack even more. I pulled 84 assorted blocks from the stack, and then cut squares from some beige fabric that was trimmed from a quilt back. The 84 colored squares were paired with 84 beige squares to create 168 HST (half-square triangle) blocks. 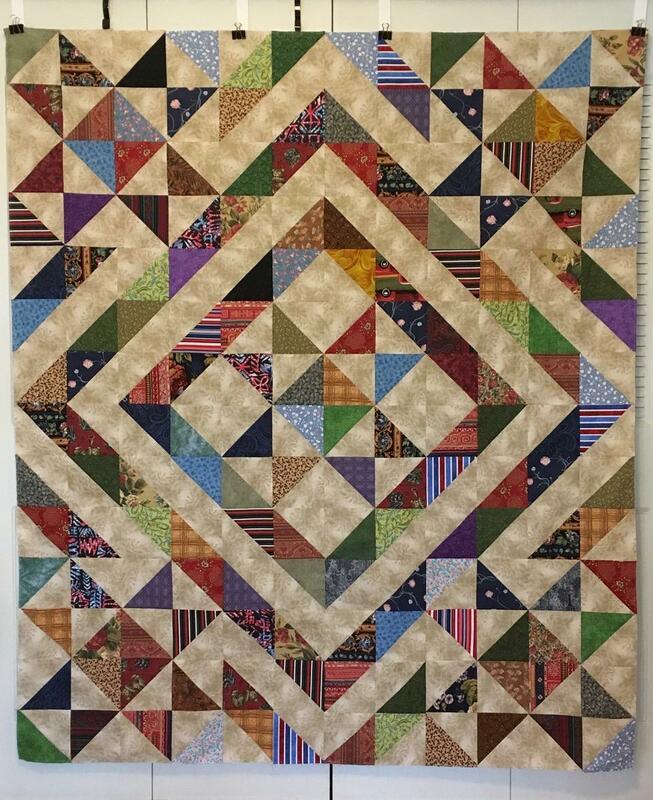 I trimmed the blocks to 5.5 inches to be used in another Quilt of Valor. 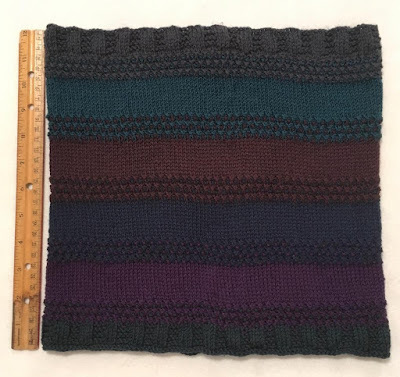 I finished the Tool Box cowl on Saturday and blocked it on Sunday. The kit was purchased on Craftsy: color way - Purple Martin. 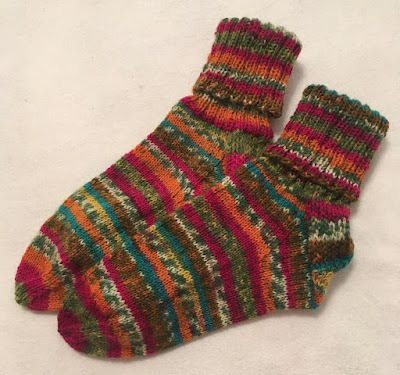 The teal section (second from the top) was not included in the kit but was knit with some scrap Cherry Tree Hill sock yarn. 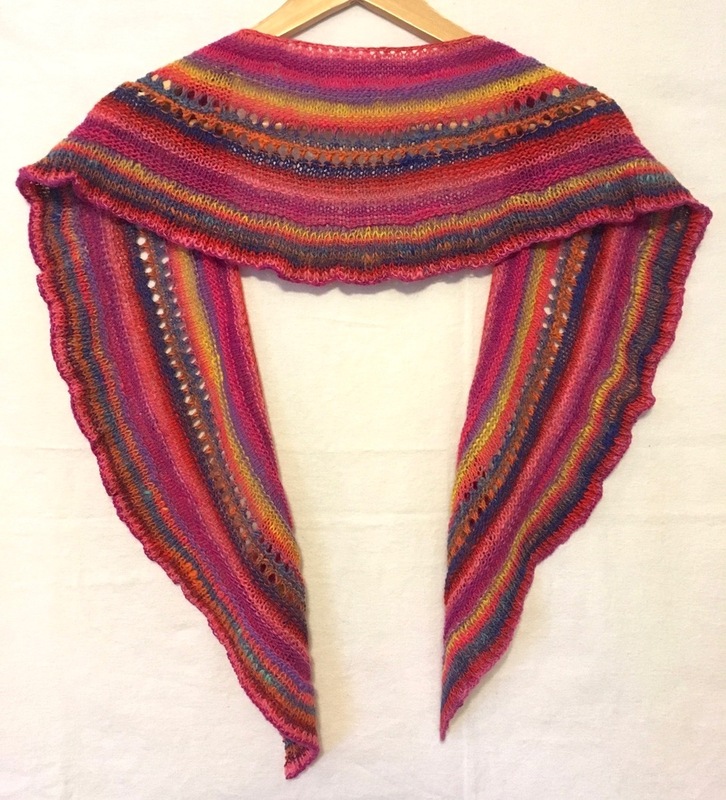 I have enough of the kit yarn remaining to knit another cowl because I was unsure if the kit had enough yarn for the larger cowl size. 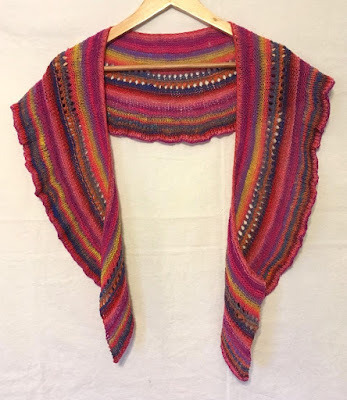 When I cleaned my sewing room last week, I unearthed the unblocked Colorful Cousin shawl. It was finished in September but got pushed aside and forgotten. Sunday, I gave it a good soak and finally got it blocked. The colors are vibrant (much to bright for me), but I will find someone who loves it. 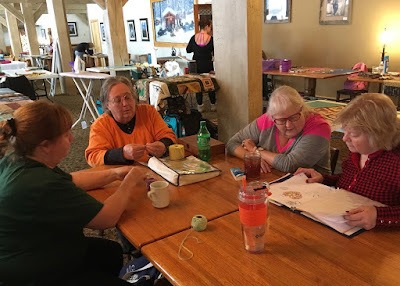 Knitting notes can be seen in this earlier post. 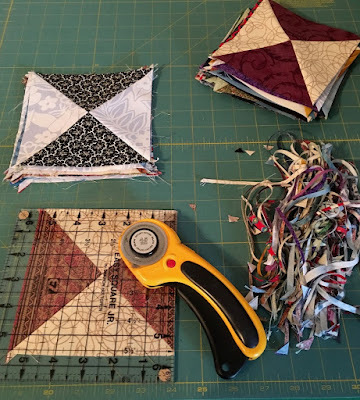 Last week, I worked with squares in my 6.5 inch square scrap bin. The stack of squares was nearly four inches high. 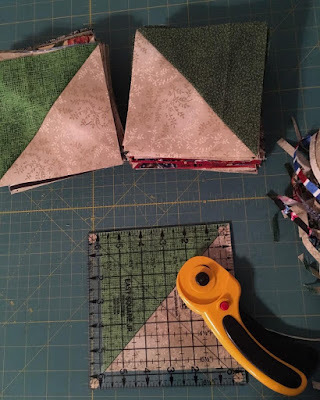 I pulled out 60 dark squares and 60 light squares and made 120 hourglass blocks for a Quilt of Valor. Sewing and trimming the blocks took a couple of afternoons/evenings. Since the Daylight Saving Time ended on Saturday evening, I've decided to name this quilt, Time in a Bottle. I listened to Jim Croce a lot in the 1970s, and hearing his voice takes me back to those days. What singer brings back a special time in your life? 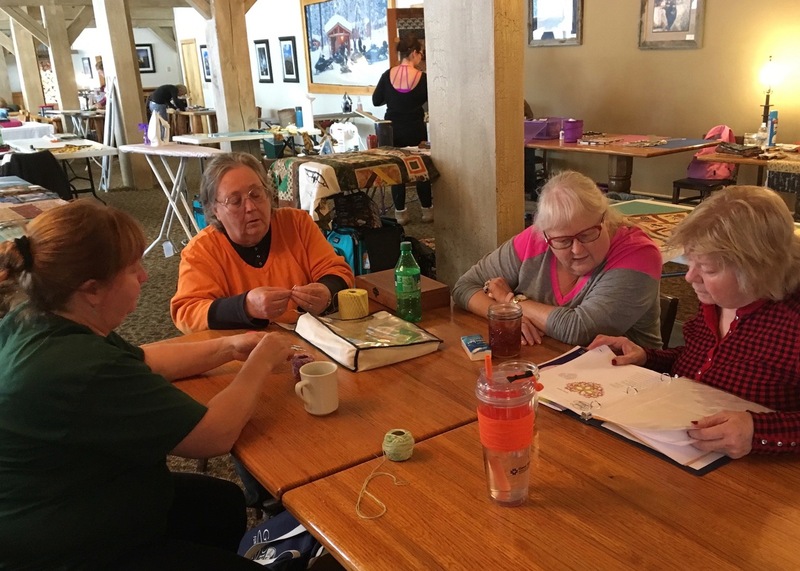 Cinde P. plans a Fiber Retreat at Togwotee Lodge twice a year when the Lodge is officially closed (between seasons) in November and April. This year's November retreat was Friday, Saturday, and Sunday. I considered going to the retreat in the past, but life always seemed to get in the way. Sue asked me a couple of weeks ago if I wanted to go with her for just the day - Saturday. I agreed. 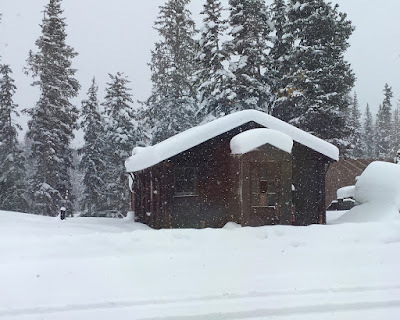 Then Thursday it began to snow in the mountains, it continued to snow on Friday, and on Saturday, the snow was still falling. 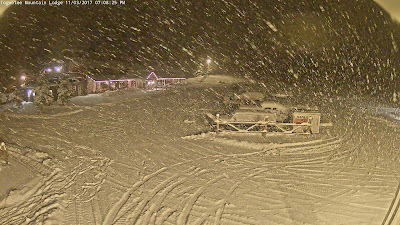 The roads looked pretty dicey on the WYDOT webcams and. 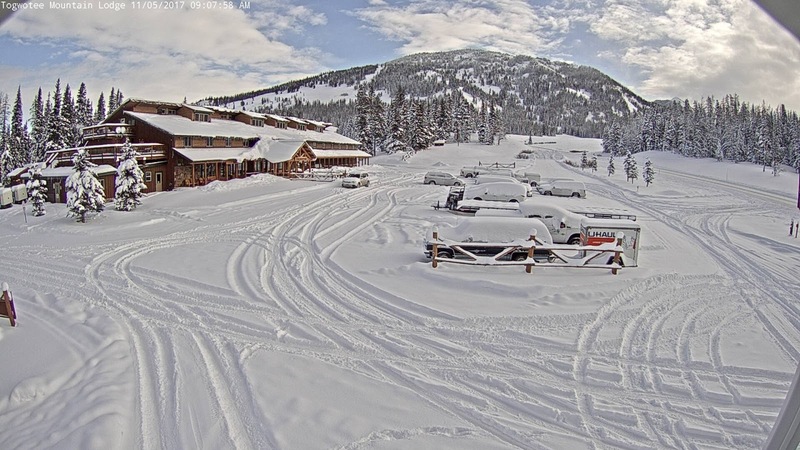 . .
the webcam at the Lodge didn't look any better. 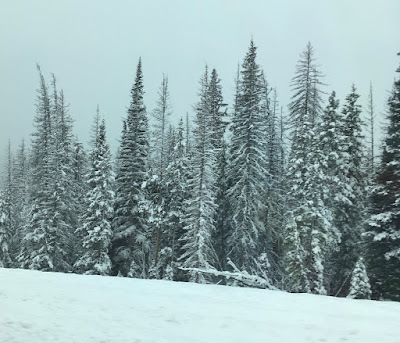 I've lived in Wyoming nearly all my life and have driven in some nasty conditions during the winter, so I tend to avoid being out on the roads when they look like this. The weather report for Saturday predicted even more snow on the Togwotee Pass. 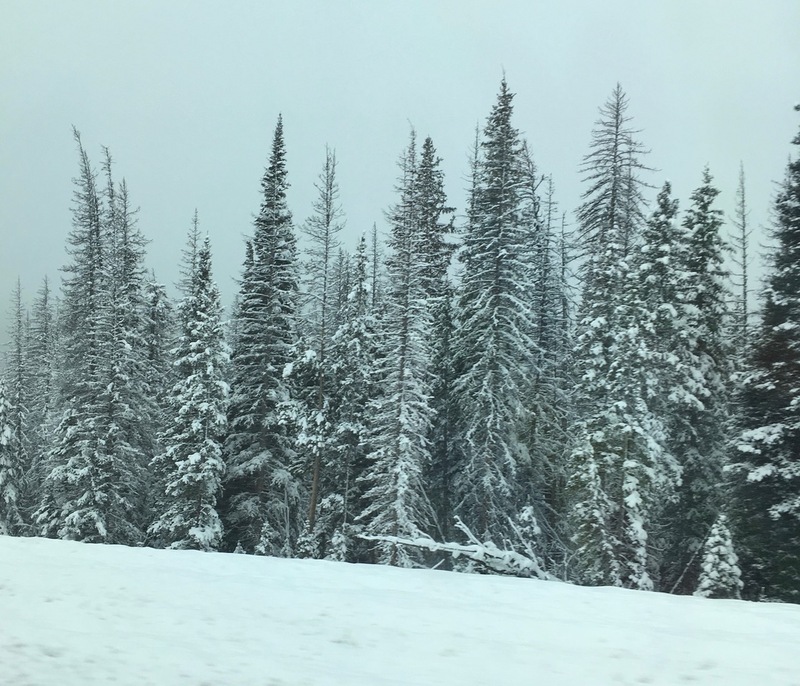 I dreaded traveling up the mountain on the snowy roads. Friday afternoon, I texted Sue to tell her I was going to pass on the trip. Since I didn't need to get up early, I stayed up late (12:30 AM) working on a quilt and slept through my 6:30 AM alarm. At 8:00 AM my doorbell rang, and then my cell phone rang: Sue was standing on my door step. 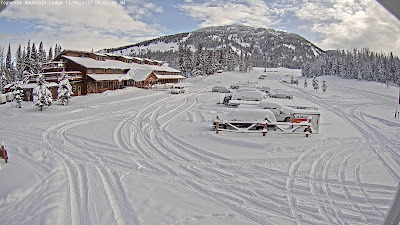 After a bit of discussion about the road conditions, we agreed to head west. If the roads were too bad, we would turn around and head back. I threw on some clothes, brewed a quick cup of tea, and we were on the road by 8:20 AM. The first 70 miles, we drove through intermittent fog, but the roads were basically dry. Then just outside of Dubois, it began to snow, and the roads were covered with snow just as the webcams had shown. A couple of snowplows were headed east, and traffic was light. 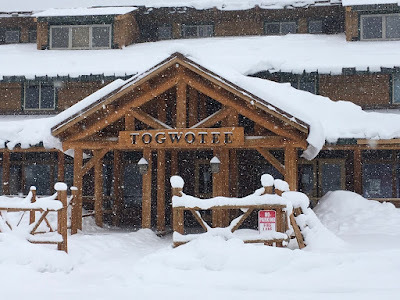 Slowly, we worked our way west, up the mountain, and over the Continental Divide to Togwotee Mountain Lodge. We arrived at the Lodge about 11:20 AM, and I'd estimate 20 inches of snow was in the parking lot. 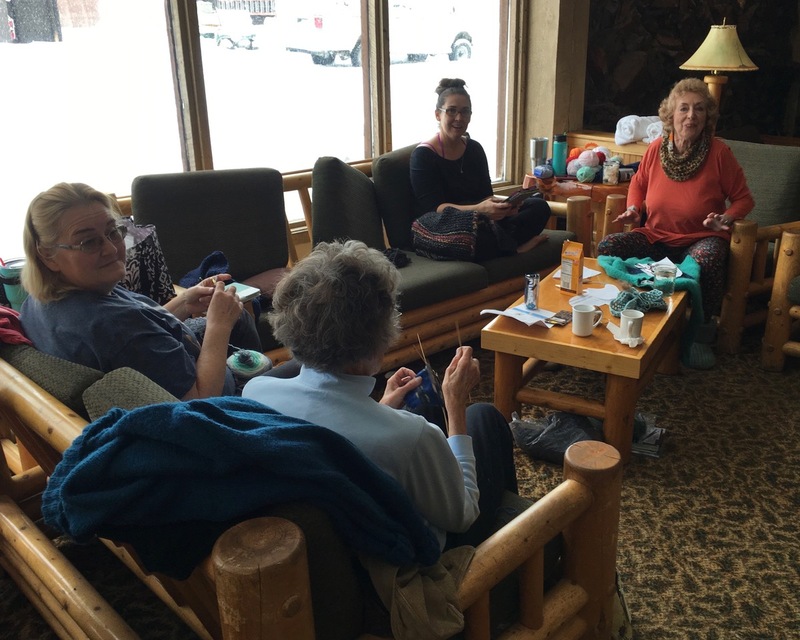 Inside the Lodge, thirty women who had arrived on Friday were busily working and chatting. A small group was near the large fireplace knitting and crocheting and some had spinning wheels ready to be used as well. 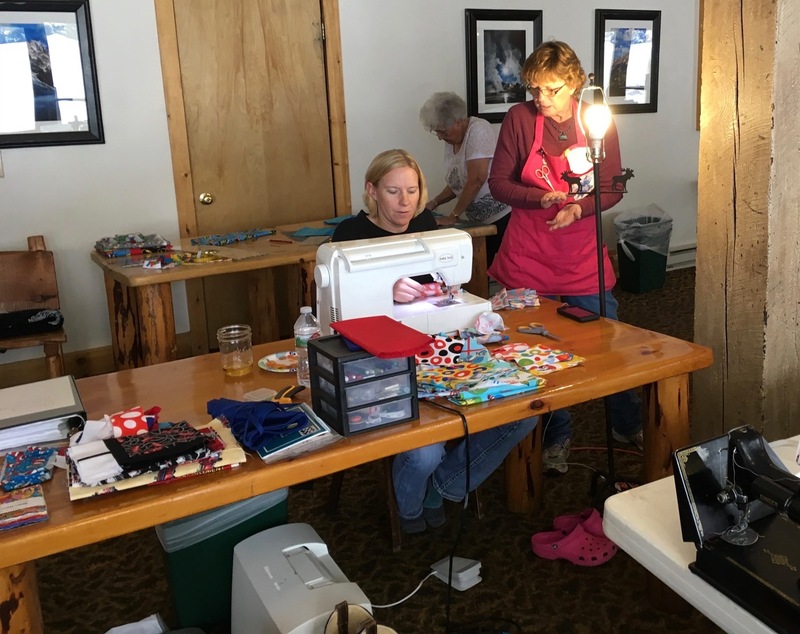 Another part of the large room was occupied by several quilters. They had quite a set-up with cutting mats, ironing boards, sewing stations, and table for laying out quilt blocks. The large windows offered a view of some older cabins. It was lovely to knit, visit, and watch the snow fall. By the time Sue and I left at 3 PM another three inches had fallen. The snow was up to my knees as we walked to the vehicle. Again, we met a snow plow, but our lane had not been cleared. Sue did a great job driving. The road was clear by the time we got to the Brooks Lake road, and in Dubois, the roads were dry. 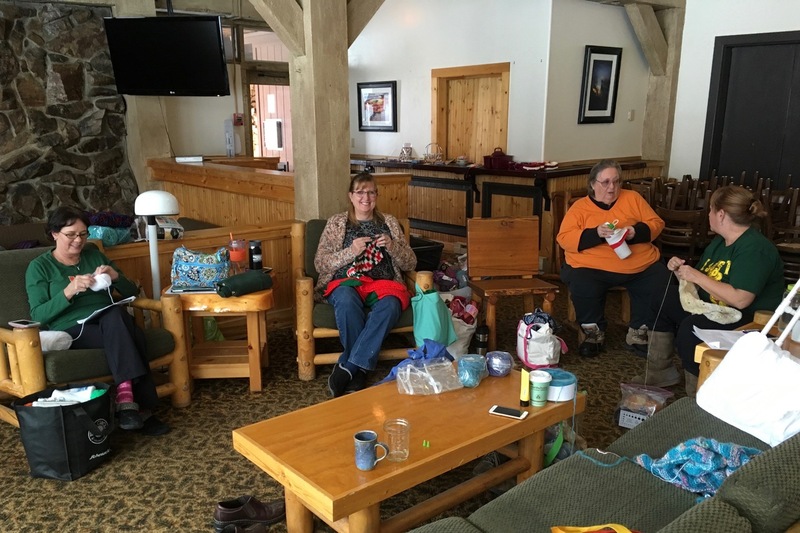 We talked about attending the retreat in April and staying the whole weekend. I just hope it doesn't snow . . .